This is a one-time, non-renewable scholarship to be used for post-secondary education purposes. Any materials received after the specified due date will not be eligible for consideration. You must be a high school senior on track to graduate or a college student enrolled in an accredited four-year university/college, or currently enrolled in a two-year college and planning to transfer to a four-year university/college upon completion. You have earned, or will earn your high school diploma this calendar year. You are a U.S. Citizen or hold Permanent Residency status. DACA recipients are welcome to apply. You must complete all entry fields on the application for the scholarship. Failure to do so will result in disqualification. Entries that do not meet the word count requirement will not be considered. School Transcripts - We may require an official or unofficial transcript from your current educational institution. 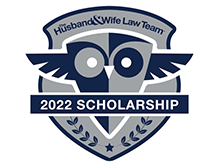 If we decide your application puts you in contention as a finalist and potential winner of the scholarship, you will be contacted by our firm and given instructions on how to send an electronic version of your official transcript. This will help us to verify that all information provided to us is accurate, and that you meet all of the eligibility requirements. Do not send any transcripts until explicitly requested by the firm. Current Proof of Enrollment - You will be required to submit upon request an enrollment verification letter, letter of acceptance from a college, or course registration for the coming semester. Photo ID - We will require a copy of your U.S. driver's license, U.S. state ID card, DACA ID, and/or passport. These are the only acceptable forms of identification to submit to us upon request.